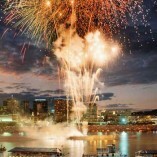 P&G Riverfest is Greater Cincinnati and Northern Kentucky’s big boom, the end of summer blowout that concludes with one of the largest fireworks displays in the Midwest – the Cincinnati Bell/WEBN Fireworks. This signature Cincinnati event began more than 30 years ago when WEBN treated the tri-state to a fireworks show in honor of the radio station’s 10th anniversary. The party at Sawyer Point, held annually on the Sunday of Labor Day weekend, has grown into an all-day affair with music, food and family fun and entertainment all day (Cincinnati’s Sawyer Point is a no-alcohol zone for Riverfest). Nearly a half-million people attend on both sides of the river. Highlights: the Ohio/Kentucky shout-off just before the fireworks, and WEBN’s soundtrack, choreographed with Rozzi’s Famous Fire Works.